"The Forever War" was first published in 1974 and since then it was republished on several occasions (I've counted around 13) – these editions varying from simple reprints to the authors definite edition in 1997 and to the inclusion into the "royal" SF Masterworks collection. 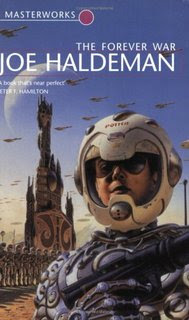 The novel was a solemn winner of both Nebula and Hugo awards and the fact that it is praised worldwide as one of the cornerstones of science fiction ever-since leaves little doubt that "The Forever War" withstood the test of time, as well as cows this reviewer with the weight of its historically accumulated pedigree. It’s really hard to review such a weighty title without being a part of the period that defined its becoming. Among other themes Haldeman tackles various contemporary issues of that time – Vietnam War is a prominent one for example (Haldeman fought there for a while). But let us not forget the fact that "The Forever War" would have never be lauded as a "classic", if the book hadn’t dealt with the issues of that time in a more general, universal and all-comprising way, if you wish. Haldeman deftly tackles and speculates about the nature of war, politics, society, philosophy, science, essence of humanity and personal relations in grand, intelligent and on occasion even clairvoyant manner. It is the year of 1996. Humankind is in possession of space faring technology, and the conquest of the universe runs smoothly until one of the human colonists’ ship is attacked by before unencountered but obviously belligerent alien race – the Taurans. William Mandella is a first wave conscript for the elite UN task force being assembled for a war against Taurans. What makes him a candidate for the task force is his above average intelligence, education and physical prowess. The story begins during the stark and uncompromising initial training of the first group of recruits, which is the cause of first military casualties. Afterwards, “the real thing” follows; we are witness to long and time-consuming space voyages destined at some obscure out-in-the-nowhere solar systems, where battles with Taurans rage to and fro. There is always a chance that the enemy will have technological advantage over human forces or the other way around due to the time discrepancies, caused by faster than light travel. The toll on human life is excruciating. Mandella succeeds in retiring, but finds The Earth some twenty-one years later, two years of his subjective time, changed beyond the face of recognition (sadly for the worse) and once everything that ties him down passes away he volunteers back into the army. Just as soon as that he finds himself in the clutches of interstellar warmongering…for another thousand years or so - give or take a few years. Hence the name of the novel – “The Forever War”...indeed. “William?” She had MCCOY stenciled above her face-plate. Everybody was jumping up and down to keep warm. “How c-cold do you think, it is, M-Mandella?” That was McCoy. “Ung…wish they’d, get some, fucken, heat in, this place.” It always affects the small women more than anybody else. McCoy was the littlest one in the company, a waspwaist doll barely five feet high. I’m aware of the fact that I might be reiterating some of the facts that have been pointed out a countless of times before, but that is always a risk when reviewing things that have been in circulation and public eye for so long. William Mandella is a well round character, presented with conviction and what is always welcome – likable. He is well-read, fair, observant, introspected and slightly disinclined towards arrogance and authority (or any other kind of position holding power). I always had a thing for first person narrative, if and especially if the protagonist is consistent and sympathetic. Other characters in the novel are coping with the situation in a way as as anyone would in such morose circumstances. Staying alive is a top priority, while enjoying every free moment follows by a small margin. Even though there are some explicit themes involved, Haldeman handles them civilly and with elegance throughout. They are incorporated naturally without making them the focal point of the plot or treating them abrasively, even though there is some pretty avant-garde tinkering with social conventions involved (state approved homosexuality; queerness of heterosexuality; military coordinating who gets to bunk with whom over night etc.). Everything from scientific breakthroughs to sociological speculations about how future societies might look like is well thought out and explained. “The Forever War” certainly has similar flavor to one other SF Masterworks classic I’ve managed to read; I’m speaking of “The Left Hand of Darkness” by Ursula K. LeGuin, this book I cannot recommend highly enough. "The Forever War" is by no means dauntless. The prose shows signs of old age as do some of the concepts, which the newer generations of science fiction authors managed to polish further. Haldeman can be sometimes also quite heavy on the science part of the fiction. This makes the setting more plausible, but disrupts and dampens the pace. Of action we see surprisingly little, at odds with the fact that this is basically considered a war novel. I would also have opted for more dialogue and more of the witty snipets which would normally spice things up (Haldeman certainly has a flair for being funny and ironic), but this is really just my personal preference and not an objective criticism. It seems I’m on a goodreadin’ streak lately; enjoying all the books that I read, but that does nothing to diminish the worth garnered by this novel over the years. As I’ve already said it is quite on par, quality-wise, with LeGuin’s heavyweight novel from about the same time - “The Left Hand of Darkness”. Do yourself a favor and pick up at least one of these two books, as they are (1)great representatives of their genre; (2)they shine an illuminating light on contemporary science fiction literature; as well as (3)contain a distinct flavor of the period in which they were written in. I’m unable to decide between the grade 4/5 and 4,5/5, so I leave this to decide for yourselves.